Opening Night Party of our 2017 Second Half Career Art Exhibition: Celebrating Living Old Masters on October 24, 2017 from 6:30-9pm. We would be delighted if you could join us for the Opening Night Party of our 2017 Second Half Career Art Exhibition: Celebrating Living Old Masters on October 24th, 2017 from 6:30-9pm (see invitation below). The exhibition will continue on October 25th from 10:00-4pm. 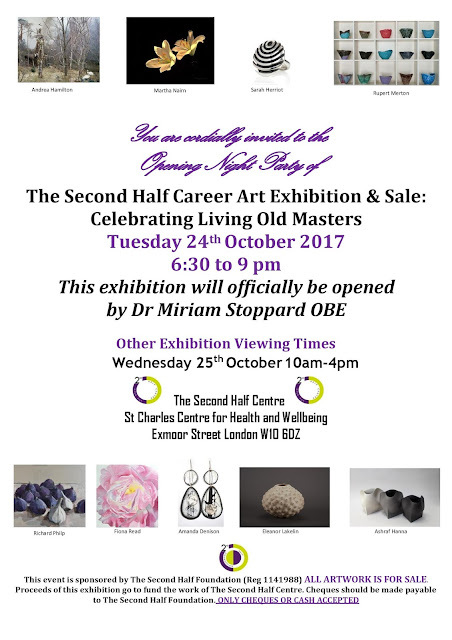 Dr Miriam Stoppard OBE, author, television presenter and advice columnist will officially open the exhibition at 7pm. We really look forward to welcoming you on Opening Night.